Eight Vermilion County Heroes were honored during an event at the Turtle Run Banquet Center in Danville today (Thursday). 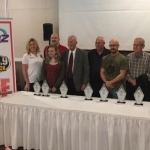 All eight had been nominated by their peers for the awards sponsored by Neuhoff Media and some local co-sponsors. Keith Peoples, the Schlarman Girls Basketball Coach, received the Education Hero award for lessons he teaches his players both on and off the court. The Youth Hero Award went to Ciera Beith, a Danville High School freshman. She works with others trying to break the cycle of generational addiction. Fowler Connell was presented the Senior Hero Award. He is 94, but is still very active in the community, including being a valued member of the sports broadcasting team at WDAN Radio. Connell has logged more than 4,000 volunteer hours at the Veterans Administration Medical Center in Danville. The Military Hero Award was presented to Dave Hughes, a Coast Guard Veteran who started the Mission K9 Warrior Project. It provides service dogs for veterans with post traumatic stress disorder. 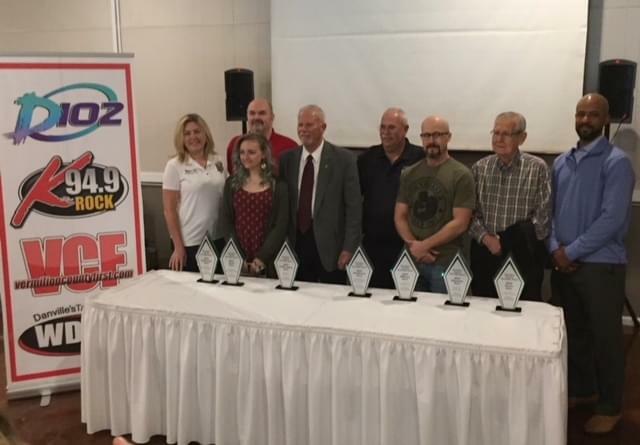 Others recognized included Willam Butch Fields, who received the Healthcare Hero Award….Michael Rohall, recipient of the Workplace Hero Award, and Jenny Merrell, who got the Community Hero Award. Merrell works year round to raise funds to support Working Out PTSD – a program that provides free gym memberships to local Veterans. Fields has been serving in the emergency medical field in Tilton for 40 years. He also is a co-founder of the Tilton Red Neck Games. Michael Rohall, through his work as Executive Director at Love, Inc has found a way to connect those needing help with organizations and churches.